Finally! Valve's Steam summer sale has begun. Current discounts include Portal 2 for $5 and Call of Duty: Modern Warfare 3 for $30. There are also some ridiculously cheap company packages, including a Bethesda pack for $50 (featuring Skyrim, Fallout: New Vegas, and more) and a $50 Ubisoft collection that will give you Assassin's Creed: Revelations, Might and Magic Heroes VI, and more. "The annual Steam Summer Sale is on now," Valve said in a press release today. 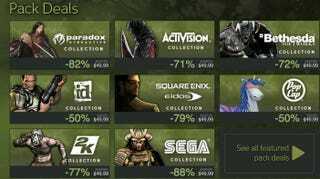 "Gamers will find amazing deals on thousands of games. The Summer Sale will again feature more than straight discounts, offering Daily Deals, Flash Sales, and 'Customer Choice' Sales, the latter allowing gamers to vote for a title on a given list to be put on sale for a limited time. " Valve says it will release new daily discounts up until July 22. Sale ends then!